Heat oven to 325°F. Place 1 cup of the baking chips in 2-cup microwavable measuring cup. Microwave uncovered on Medium (50%) 3 to 4 minutes or until chips are softened. Stir chips until smooth; cool. In large bowl, beat sugar, butter, vanilla and eggs with electric mixer on medium speed until creamy. Beat in melted chips on low speed. Stir in flour, baking soda and cream of tartar. Stir in remaining 2/3 cup baking chips and the nuts. Drop dough by rounded teaspoonfuls about 2 inches apart onto ungreased cookie sheet. Bake 10 to 12 minutes or until very light brown. Cool 2 minutes; remove from cookie sheet to wire rack. Stir enough paste icing color into melted coating until desired color. (Liquid food color would stiffen the coating.) 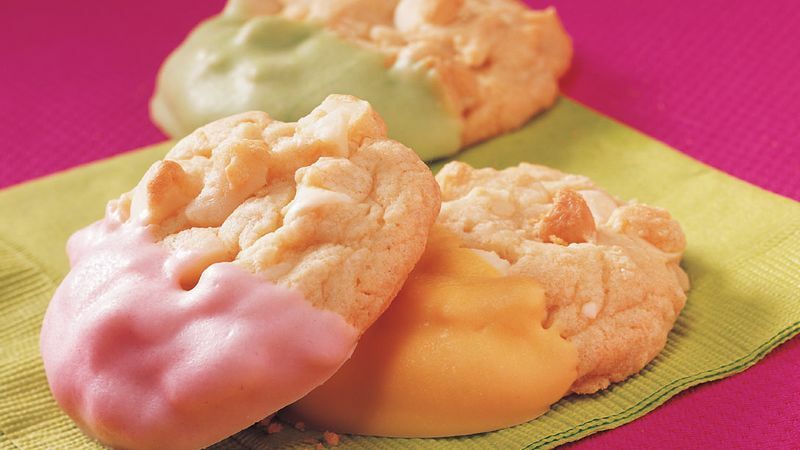 Dip half of each cookie into colored coating; place on waxed paper until firm. If you like, divide coating in half and tint each half a different color. Dip half of each cookie into coating; place on waxed paper until firm. Let first color set before dipping again.